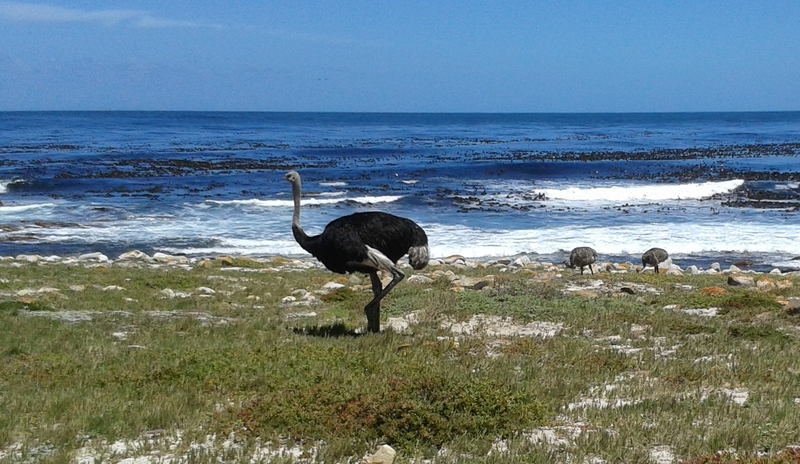 I like taking tourists to the Cape Point Ostrich Farm. Ernst the owner is a retired orthopaedic surgeon who takes quite an interest in the anatomy and lifestyle of ostriches. He keeps his in paddocks with a breeding pair in each, and he says that ostriches and humans have a lot in common. Like us, they run around on two legs – but a lot faster than we do. They live for 70 to 80 years. They mate for life; but just like human beings, if they can get a bit on the side they will. The males are always in the mood for love, and the girls are not – they sometimes have a headache. To give the girls a rest from being chased around the paddocks by the randy boys he separates the sexes for a couple of months in the winter. Then, on the first day of spring he puts them together again. It seems that, even with ostriches, absence makes the heart grow fonder. So, on that day they are all in the mood. “It’s like a whorehouse here” says Ernst. Very interesting! Especially the fact that they live for so long! I found it so interesting to see a picture of ostriches with the sea in the background – so unusual!